After World War II, an atomic hierarchy emerged in the noncommunist world. Washington was at the top, followed over time by its NATO allies and then Israel, with the postcolonial world completely shut out. An Indian diplomat called the system ""nuclear apartheid."" 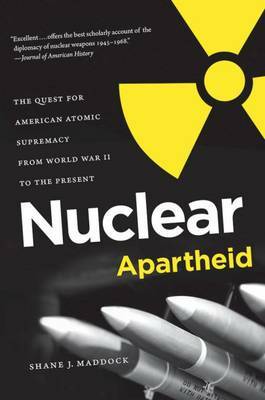 Drawing on recently declassified sources from U.S. and international archives, Shane Maddock offers the first full-length study of nuclear apartheid, casting a spotlight on an ideological outlook that nurtured atomic inequality and established the United States--in its own mind--as the most legitimate nuclear power. Beginning with the discovery of fission in 1939 and ending with George W. Bush's nuclear policy and his preoccupation with the ""axis of evil,"" Maddock uncovers the deeply ideological underpinnings of U.S. nuclear policy--an ideology based on American exceptionalism, irrational faith in the power of technology, and racial and gender stereotypes. The unintended result of the nuclear exclusion of nations such as North Korea, Pakistan, and Iran is, increasingly, rebellion. Here is an illuminating look at how an American nuclear policy based on misguided ideological beliefs has unintentionally paved the way for an international ""wild west"" of nuclear development, dramatically undercutting the goal of nuclear containment and diminishing U.S. influence in the world.